Welcome to July’s Month of Math Software, my regular summary of news and releases in the world of software for the mathematically inclined. If you have a news item that you’d like to share in next month’s offering then feel free to contact me to discuss it. If you like what you see here then take a look at some of the previous editions. VSN International have released version 14 of their data analysis tool, Genstat for the biosciences. Interestingly, they also have a cut-down free version of Genstat for teaching use in schools and Universities. Jacket, the most feature-complete GPU toolbox for MATLAB, was updated to version 1.8 this month with a whole host of new features and functions. Jacket’s sister project, libJacket– a GPU library for C/C++/Fortran and Python, also saw an update to version 1.1. Version 12 of the general purpose statistical package, STATA, has been released. Click here to get the large pdf file that announces this release and tells us what’s new. 2.17-10 of the computer algebra package, MAGMA, has been release. Scilab, a high quality free alternative to MATLAB, has seen a minor upgrade. Version 5.3.3 corrects a couple of bugs. Numpy is a Python add-on that is almost essential if you plan to use Python for numerical computing. It adds support for vectors and matrices to Python along with facilities such as random number generation and FFTs. Numpy was upgraded to version 1.6.1, a bugfix release, on July 20th. StrongInference has put up a great article about the upcoming IPython 0.11. 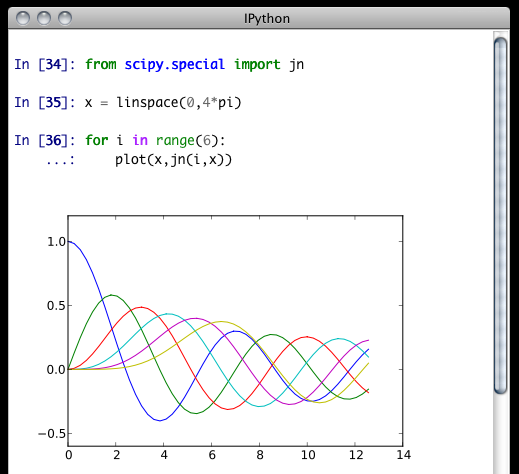 IPython is an enhanced interactive python shell that includes things such as matplotlib integration, interactive parallel computing and more. It’s great for the sort of interactive scientific calculations that people might otherwise use MATLAB and Mathematica for. The Mathworks show us how to calculate the Mandelbrot factal on a GPU using the Parallel Computing Toolbox. Wolfram Research officially launch the CDF document format. Learn how to embed them into webpages. Over at Playing with Mathematica, Sol has gone crazy with Mathematica clocks. This is part 1 of an ongoing series of articles about MATLAB programming for GPUs using the Parallel Computing Toolbox. The introduction and index to the series is at http://www.walkingrandomly.com/?p=3730. Have you ever needed to take the sine of 100 million random numbers? Me either, but such an operation gives us an excuse to look at the basic concepts of GPU computing with MATLAB and get an idea of the timings we can expect for simple elementwise calculations. Now I take the sine of all 100 million elements of cpu_x using a single command. I have to confess that I find the above command very cool. Not only are we looping over a massive array using just a single line of code but MATLAB will also be performing the operation in parallel. So, if you have a multicore machine (and pretty much everyone does these days) then the above command will make good use of many of those cores. Furthermore, this kind of parallelisation is built into the core of MATLAB….no parallel computing toolbox necessary. As an aside, if you’d like to see a list of functions that automatically run in parallel on the CPU then check out my blog post on the issue. Elapsed time is 0.833626 seconds. Elapsed time is 0.899769 seconds. Elapsed time is 0.916969 seconds. I note that this time is smaller than any of the three test times I did before running the loop and I’m not really sure why. I’m guessing that it takes my CPU a short while to decide that it’s got a lot of work to do and ramp up to full speed but further insights are welcomed. While staring at the CPU monitor I noticed that the above calculation never used more than 50% of the available virtual cores. It’s using all 4 of my physical CPU cores but perhaps if it took advantage of hyperthreading I’d get even better performance? Changing OMP_NUM_THREADS to 8 before launching MATLAB did nothing to change this. The first thing you need to know about GPUs is that they have their own memory that is completely separate from main memory. So, the GPU doesn’t know anything about the array created above. Before our GPU can get to work on our data we have to transfer it from main memory to GPU memory and we acheive this using the gpuArray command. Once the GPU can see all our data we can apply the sine function to it very easily. Finally, we transfer the results back to main memory. Just like the CPU version, I repeated this calculation several times and took an average. The result was 0.3008 seconds giving a speedup of 2.75 times compared to the CPU version. On my system this takes 1.0159 seconds on average– longer than it takes to simply do the whole thing on the CPU. So, for this particular calculation, transfer times between host and GPU swamp the benefits gained by all of those CUDA cores. I then ran this on my laptop for array sizes ranging from 1 million to 100 million and used the results to plot the graph below. So far in this little story things are not looking so hot for the GPU and yet all of the ‘GPUs are awesome’ papers you’ve ever read seem to disagree with me entirely. What on earth is going on? Well, lets take the advice given by csgillespie.wordpress.com and turn it on its head. How do we get awesome speedup figures from the above benchmarks to help us pump out a ‘GPUs are awesome paper’? 0. Don’t consider transfer times between CPU and GPU. We’ve already seen that this can ruin performance so let’s not do it shall we? As long as we explicitly say that we are not including transfer times then we are covered. 1. Use a singlethreaded CPU. Now we’re talking! I can now claim that my GPU version is over 9 times faster than the CPU version. 2. Use an old CPU. My laptop has got one of those new-fangled sandy-bridge i7 processors…one of the best classes of CPU you can get for a laptop. If, however, I was doing these tests at work then I guess I’d be using a GPU mounted in my university Desktop machine. Obviously I would compare the GPU version of my program with the CPU in the Desktop….an Intel Core 2 Quad Q9650. Heck its running at 3Ghz which is more Ghz than my laptop so to the casual observer (or a phb) it would look like I was using a more beefed up processor in order to make my comparison fairer. So, I ran the CPU benchmark on that (in singleCompThread mode obviously) and got 4.009 seconds…noticeably slower than my laptop. Awesome…I am definitely going to use that figure! I know what you’re thinking…Mike’s being a fool for the sake of it but csgillespie.wordpress.com puts it like this ‘Since a GPU has (usually) been bought specifically for the purpose of the article, the CPU can be a few years older.’ So, some of those ‘GPU are awesome’ articles will be accidentally misleading us in exactly this manner. 3. Work in single precision. OK, so switching to single precision made the CPU version a bit faster but it’s more than doubled GPU performance. We can now say that the GPU version is over 28 times faster than the CPU version. Now we have ourselves a bone-fide ‘GPUs are awesome’ paper. So far I have been comparing the CPU against the relatively lowly GPU in my laptop. Obviously, however, if I were to do this for real then I’d get a top of the range Tesla. It turns out that I know someone who has a Tesla C2050 and so we ran the single precision benchmark on that. The result was astonishing…0.0295 seconds for 100 million numbers not including transfer times. The double precision performance for the same calculation on the C2050 was 0.0524 seonds. We took an Nvidia Tesla C2050 GPU and mounted it in a machine containing an Intel Quad Core CPU running at 3Ghz. 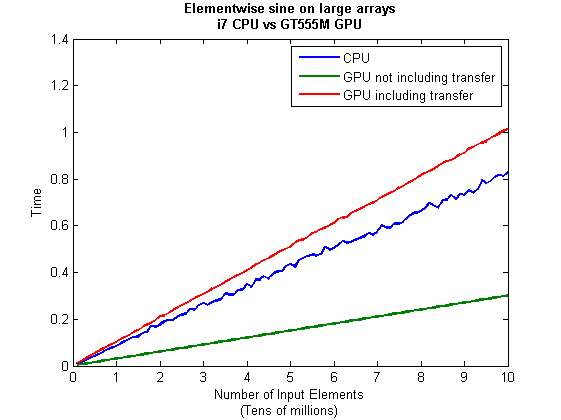 We developed a program that performs element-wise trigonometry on arrays of up to 100 million single precision random numbers using both the CPU and the GPU. The GPU version of our code ran up to 118 times faster than the CPU version. GPUs are awesome! I ran the sine_test benchmark on several different systems for 100 million elements. The CPU was set to be multi-threaded and double precision was used throughout. Tesla C2050, Linux, 2011a – 0.7487 seconds including transfers, 0.0524 seconds excluding transfers. MATLAB’s new GPU functions are very easy to use! No need to learn low-level CUDA programming. It’s very easy to massage CPU vs GPU numbers to look impressive. Read those ‘GPUs are awesome’ papers with care! In real life you have to consider data transfer times between GPU and CPU since these can dominate overall wall clock time with simple calculations such as those considered here. The more work you can do on the GPU, the better. My laptop’s GPU is nowhere near as good as I would have liked it to be. Almost 6 times slower than a Tesla C2050 (excluding data transfer) for elementwise double precision calculations. Data transfer times seem to about the same though. In the next article in the series I’ll look at an element-wise calculation that really is worth doing on the GPU – even using the wimpy GPU in my laptop – and introduce the MATLAB function arrayfun. 1 – MATLAB 2011a can’t create random numbers directly on the GPU. I have no doubt that we’ll be able to do this in future versions of MATLAB which will change the nature of this particular calculation somewhat. Then it will make sense to include the random number generation in the overall benchmark; transfer times to the GPU will be non-existant. In general, however, we’ll still come across plenty of situations where we’ll have a huge array in main memory that needs to be transferred to the GPU for further processing so what we learn here will not be wasted. OS: Windows 7 Home Premium 64 bit. I’m not using Linux because of the lack of official support for Optimus. Thanks to various people at The Mathworks for some useful discussions, advice and tutorials while creating this series of articles. These days it seems that you can’t talk about scientific computing for more than 5 minutes without somone bringing up the topic of Graphics Processing Units (GPUs). Originally designed to make computer games look pretty, GPUs are massively parallel processors that promise to revolutionise the way we compute. Well it would be wouldn’t it?! In other news, Lewis Hamilton can drive his F1 supercar around Silverstone faster than my dad can in his clapped out 12 year old van! These articles are so prevalent that csgillespie.wordpress.com recently published an excellent article that summarised everything you should consider when evaluating them. What you do is take the claimed speed-up, apply a set of common sense questions and thus determine a realistic speedup. That factor of 150 can end up more like a factor of 8 once you think about it the right way. That’s not to say that GPUs aren’t powerful or useful…it’s just that maybe they’ve been hyped up a bit too much! So anyway, back to my laptop. It doesn’t have a top of the range GPU custom built for scientific computing, instead it has what Notebookcheck.net refers to as a fast middle class graphics card for laptops. It’s got all of the required bits though….144 cores and CUDA compute level 2.1 so surely it can whip the built in CPU even if it’s just by a little bit? I will only choose algorithms that have been optimised and parallelised for both the CPU and the GPU. I will release the source code of the tests so that they can be critised and repeated by others. I’ll do the whole thing in MATLAB using the new GPU functionality in the parallel computing toolbox. So, to repeat my calculations all you need to do is copy and paste some code. Using MATLAB also ensures that I’m using good quality code for both CPU and GPU. This is the introduction to a set of articles about GPU computing on MATLAB using the parallel computing toolbox. Links to the rest of them are below and more will be added in the future. Elementwise operations on the GPU #1 – Basic commands using the PCT and how to write a ‘GPUs are awesome’ paper; no matter what results you get! Optimising a correlated asset calculation on MATLAB #1: Vectorisation on the CPU – A detailed look at a port from CPU MATLAB code to GPU MATLAB code. Optimising a correlated asset calculation on MATLAB #2: Using the GPU via the PCT – A detailed look at a port from CPU MATLAB code to GPU MATLAB code. Optimising a correlated asset calculation on MATLAB #3: Using the GPU via Jacket – A detailed look at a port from CPU MATLAB code to GPU MATLAB code. The Parallel Computing Toolbox (PCT) – The Mathwork’s MATLAB add-on that gives you CUDA GPU support. Accelereyes – Developers of ‘Jacket’, an alternative to the parallel computing toolbox. A Mandelbrot Set on the GPU – Using the parallel computing toolbox to make pretty pictures…FAST! 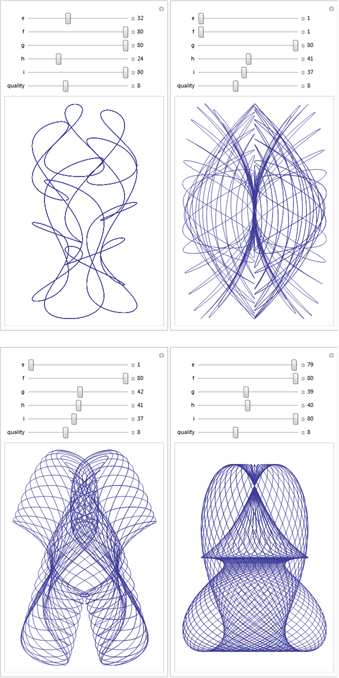 Over at Playing with Mathematica, Sol Lederman has been looking at pretty parametric and polar plots. One of them really stood out for me, the one that Sol called ‘Slinky Thing’ which could be generated with the following Mathematica command. Each parameter has its own slider (below). 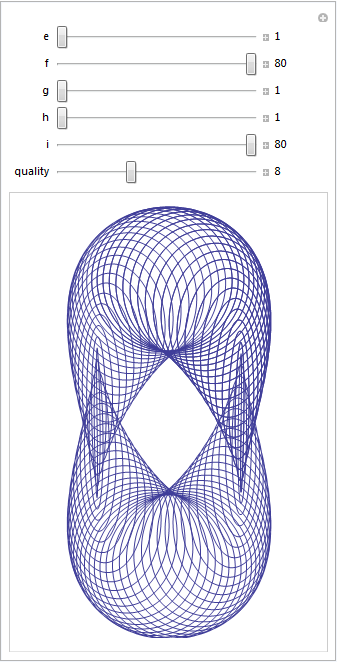 If you have Mathematica 8, or the free cdf player, installed then the image below will turn into an interactive applet which you can use to explore the parameter space of these equations. Here are four of my favourites. If you come up with one that you particularly like then feel free to let me know what the parameters are in the comments. Welcome to the 6th edition of A Month Of Math Software where I take a look at all the shiny new things that are available for a geek like me to play with. Previous editions are available here. Mark 23 of the venerable NAG Fortran Library has been released. The new version contains over 100 new routines and there is some very nice stuff to be found. They’ve beefed up their global optimization chapter for example by improving their multi-level coordinate search routine to allow equality bound constraints and also by adding a particle swarm optimizer. More news from NAG – They’ve released their Optimization routines as a R-module! Note that you need a licensed version of the NAG Fortran Library installed to use them. Octave – This open source alternative to MATLAB has seen a very minor update to version 3.4.2 which fixes some minor installation problems. Pari – Version 2.5 of this computer algebra system which specialises in number theory has been released. Get the changelog here. LibJacket v1.0 relased – This is a new product from Accelereyes, the company who have been doing GPU acceleration on MATLAB for a fee years now. With LibJacket they’ve gone a step further and released a C/C++ library. See their wiki for a list of supported functions. OK, so this isn’t mathematical software news really but good compilers are essential for fast mathematical code. There have been a couple of compiler-based news items that have got me excited this month. Pathscale EKOPath 4 compilers go open source – If you have a Linux system and are running some open-source mathematical software then there is a good chance that your software was compiled with the standard open source C-compiler, gcc. Now, gcc is a fantastic compiler but, according to many benchmarks, Pathscale’s compilers produce faster executables than gcc for many computationally intensive operations. The practical upshot for most of us is that some of our favourite software packages might be getting a free speed-hit in the near future. There’s a huge discussion thread about this over at phoronix.com. Intel have released a new open source compiler called ispc. According to Intel’s site “ispc is a new compiler for “single program, multiple data” (SPMD) programs.” The example program is a simple Mandelbrot renderer. Make those SIMD lanes in your CPU work harder for you! Why you shouldn’t use Excel 2007 for doing statistics – My answer would have been ‘because other statisticians will point and laugh at you if you do’ but it turns out that there are good mathematical reasons to not use it as well. This is an old article but worthy of further attention in my opinion. In defense of inefficient scientific code – An article I wrote last month about why code that runs inefficiently can be OK. It proved to be something of a hit on twitter so I thought I’d add it here in case you’re interested. Stand-alone code for numerical computing – because sometimes you don’t want to install a massive numerical library just to get some Gamma distributed random variates (among other things).